Everyday, everyday, 2013, is a suite of 45 water colour pencil drawings on marine ply wood. 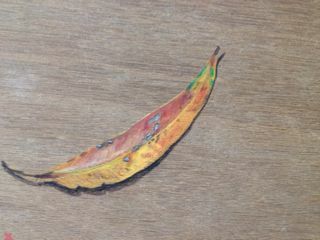 This was an exercise where I visited a small public site opposite my home everyday for 60 days, and collected a piece of nature that had fallen to the ground - returning to my studio to draw one item of nature each day. Nests, 2013, is my response to birds nests that I collect during my walks near my home. Each nest has been dislodged from its original setting in trees or bushes by the wind, rain or just natural attrition. Responding individually to these sculptural forms I raised them up and crocheted a holder or platform for them to rest on. Warbling, 2013, is a series of 5 stitchings. Listening to the native magpies near my home I recorded their melodic song by use of a gestural mark over a 24 hour period. The repeating of this mark-making eventually become a type of signature for me which I recreated into small intricate stitchings.